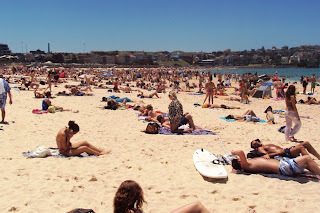 There was finally sun today, and we headed out to Bondi Beach. Most people take the train and the bus to get there, which is a weird feeling. In San Francisco we have reasonably good public transportation, but no beach weather to attract large crowds. In Los Angeles, we have great weather and beaches, but no public transportation. In any case, taking a bus to the beach is great, except on days like today when the system is overloaded. We walked from the train station, which wasn’t bad at all. In fact, walking we discover a Brazilian-owned Mexican restaurant. They served burritos and feijoada. Awesome. The beach itself was great. I’ve always been too cheap to effectively take up surfing, but I’ve always been a big fan of body surfing where you catch waves by swimming away from the crashing wave and then going into a stiff prone position. In LA it wasn’t that big of a thing, but here it’s crazy popular, which was good and bad, I suppose. Good because it’s fun to be out there with other people maneuvering the ocean together; bad because it’s crowded and you inevitably end up plowing into someone else. Today I got tangled up with a surfer who fell off his board. Awkward. Fashion at Bondi Beach also seemed to be a pretty big deal. Debating its American equivalent, I posited Miami (though I’ve never been). Luisa agreed, although she said Miami was a slightly crazier place. We agreed whatever it was, it seemed like a bigger fashion show than relatively low-key Hermosa Beach just south of LAX. Yes, Hermosa Beach is still a crazy place, I know. I’m just trying to fit things into a ranking here, okay? Anyway, there was talk of checking out Manly Beach tomorrow, but Weather.com says it’s going to rain. So now what? 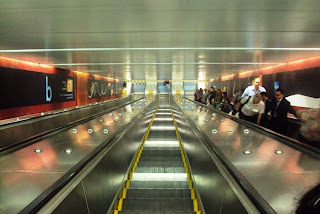 Going down the escalator in the Sydney subway. 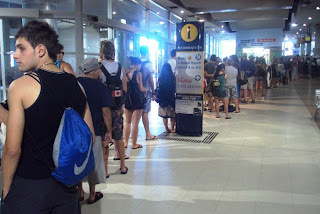 The (long) line for the bus at Bondi Junction. We eventually left this line. 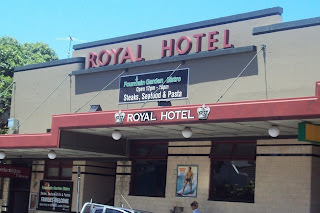 The Royal Hotel on Bondi Street, which totally looks like something out of The Royal Tenenbaums. A "royal" coincidence? I am so excited to finally see pictures of Bondi beach. So glad the sun decided to come out. You guys should still go to Manly, even in the rain. It's a nice place to go for the day. Luisa will probably take you to that Italian restaurant we ate in when we were there last. Glad you are making the most out of your trip despite the rain. Enjoy the rest of your vacation. If rains, go see Avatar in at least 3D, if not 3D Imax.